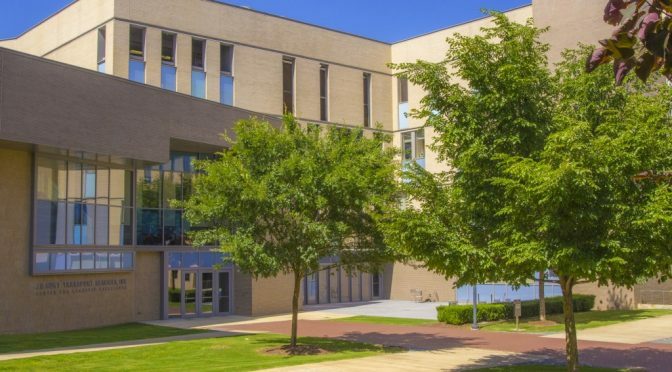 The Department of Information Systems at the Sam M. Walton College of Business and the Enterprise Systems Blockchain Consortium are hosting a conference on the basics, value propositions and technology options of blockchain. Registration closes March 30. Mary C. Lacity, Curators’ Distinguished Professor and International Business Fellow at the University of Missouri-St. Louis, is the keynote speaker for the event. 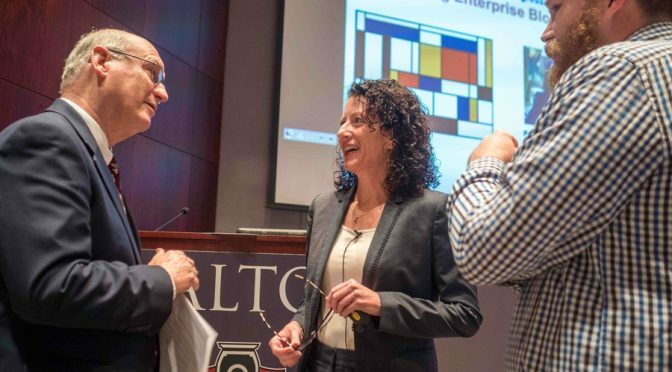 Her talk on “The Business of Blockchain as the New World Order” will kick off the event at 8:30 a.m., Friday, April 6, at the Chancellor Hotel at 70 N. East Ave. in Fayetteville. In her keynote, Lacity will be sharing the findings from her forthcoming book, A Manager’s Guide to Blockchain Applications for Business: Mindshifts, Strategies and Action Principles. Conference attendees will participate in a daylong series of panels and presentations with industry leaders from members of the Enterprise Systems Blockchain Consortium — ArcBest, IBM, J.B. Hunt Transport Inc., Tyson Foods and Walmart. 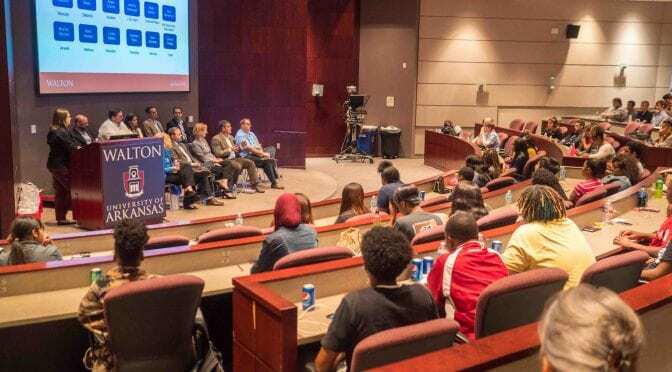 Industry and academic experts presenting at the conference include Chris Enslin and Archana Sristy of Walmart, Nikhil Gupta of IBM, Heather Czech of SAP, P.J. Johnson of Microsoft, Nitin Kale from the University of Southern California and Zach Steelman, Beth Keiffer, Ron Freeze and Rhonda Syler of the Walton College information systems department. Attendees also will also have the opportunity to build their own use case, get hands-on with Hyperledger and Ethereum or take a deeper dive into business analytics. For more information or to register for the conference go to blockchain.uark.edu. 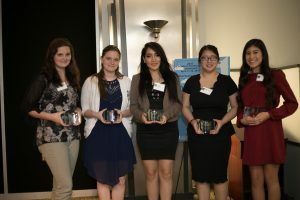 To encourage more young women to choose careers in technology, the National Center for Women & Information Technology and Information Technology Research Institute at the Sam M. Walton College of Business will recognize 23 high-school women from Arkansas for their accomplishments and aspirations in computing and technology. The 8th annual Aspirations in Computing recognition program will be held on Tuesday, April 17, as part of the 2018 Women in Information Technology Conference hosted at the University of Arkansas. 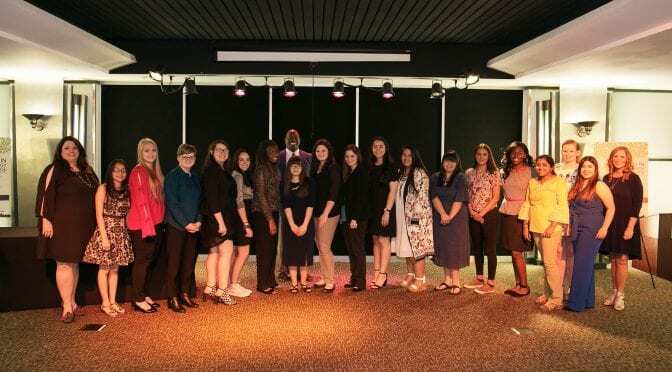 “This program encourages young talented women to purse a career in the field of technology, a field that is greatly under represented by females and minorities,” said Eric T. Bradford, managing director of the Information Technology Research Institute. The Award for Aspirations in Computing is a program of the National Center for Women & Information Technology, a coalition of over 650 universities, corporations and organizations dedicated to increasing the meaningful participation of women in computing. 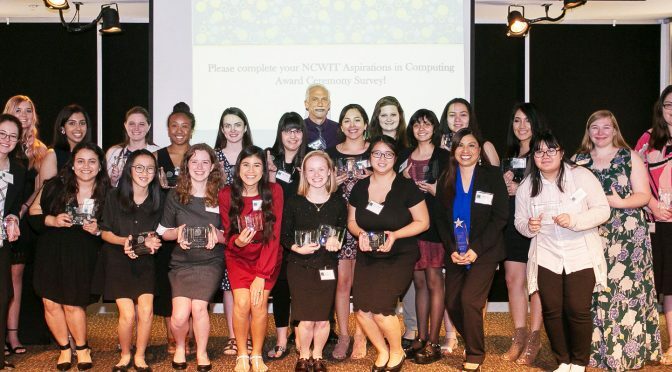 The NCWIT Award for Aspirations in Computing was created to acknowledge the computing aspirations of young women, introduce them to leadership opportunities in the field, and generate visibility for women’s participation in computing-related pursuits. Award-winners have been selected for their outstanding aptitude and interest in computing and desire to pursue computing-related studies of occupations. 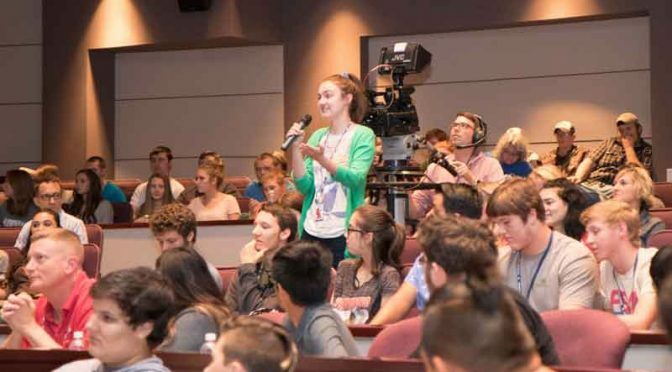 The NCWIT Aspirations in Computing program is supported by lifetime sponsor Apple, and national sponsors AT&T, Bank of America, Bloomberg, Google, HP Enterprise, Intel, Qualcomm and Microsoft with additional support from Motorola Solutions Foundation, Northrop Grumman and Symantec. NCWIT’s work leverages programs from organizations across the country, and connects efforts to increase women’s participation in information technology along the entire pipeline, from K-12 and higher education through industry and academic careers. Find out more at www.ncwit.org. 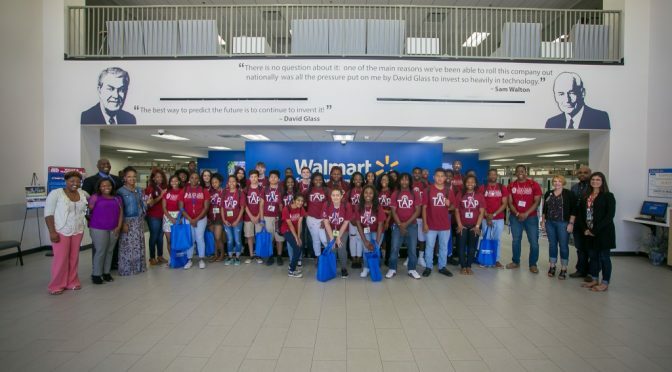 The Information Technology Research Institute at the Sam M. Walton College of Business, University of Arkansas, hosted its first IT Day for Students in Arkansas’s Delta region at Newport High School. 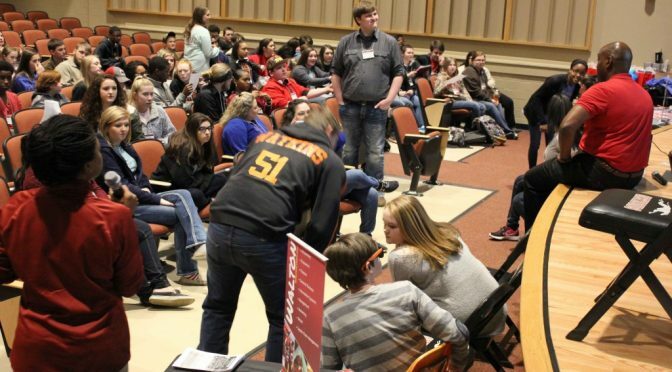 More than 115 9th through 12th grade students from Newport, Bradford, Tuckerman and Cedar Ridge attended the event held March 3. The day focused on opportunities in the field of information technology. Students participated in activities that highlighted job types, job descriptions, and salaries, as well as activities to build leadership skills. They also heard from currently information technology professionals about what it is like to work in the field. Included in the event was a Q&A session with a panel of information technology executives. Entrepreneur Rick Boosey, founder of Kyya Chocolate, served as the keynote speaker and encouraged students to follow their passion by doing something they love. Boosey also shared the value of giving and how thinking differently or finding a niche can help you be successful. Other professionals were on hand to explain the college admissions process, degree options, personal attitude and branding. Guest speakers included Rob Burgess, assistant to the dean and master instructor of computer networking technology at Arkansas State University Newport; Autumn Parker, associate director of undergraduate programs at the Sam M. Walton College of Business, University of Arkansas; Adrain Smith, director of the strengths based initiative of the Multicultural Center at the University of Arkansas; Synetra Hughes, director of student programs, Center for Retailing Excellence, Sam M. Walton College of Business, University of Arkansas. The event was sponsored by The Joe and Helen Harris Educational Foundation and the Newport Economic Development Commission in partnership with ITRI board member companies. For more information, visit itri.uark.edu/it-day-for-students.php. 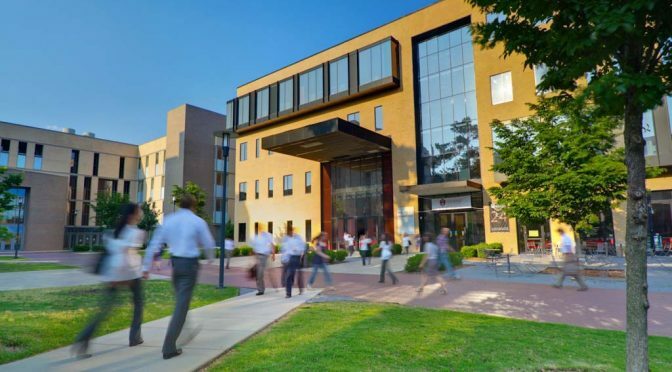 The Information Technology Research Institute in the Sam M. Walton College of Business will help answer this question by hosting an Information Technology Showcase where current University of Arkansas students can learn about the field, meet information technology leaders and be entered to win lunch with executives. The event is scheduled for Monday, Oct. 31, from 11 a.m. to 2 p.m. in the Willard J. Walker Hall atrium. All students are welcome. Tables will feature professionals by job type. Representatives from Arvest, Teradata, Walmart and others will be on hand to answer questions about information technology careers such as business analyst, IT manager, database administrator, data analyst, programmer, developer or information security analyst. Professionals will answer questions regarding which degrees are needed for various careers. Students are encouraged to visit all the tables, get an IT Showcase card stamped and be entered for a chance to win lunch with executives. Winners will be announced on the institute’s Facebook page and contacted via email. No RSVP is required. IT Showcase cards must be complete to be entered for the drawing. For more information, contact Elizabeth McCorcle at 479-575-4261 or at emccorcle@walton.uark.edu.